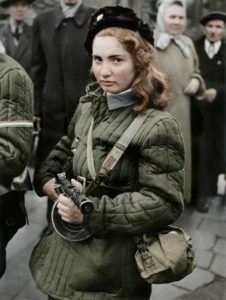 Fifteen year-old revolutionary, later shot by the Soviets. Photo by van Hansen, appeared on cover of Danish weekly Billed Bladet in Nov. 1956. Published on 7th October 2016 by International Socialism: Issue: 152. Republished with permission by LeftEast. What is being currently emphasised is the fact that the formerly illegal Communist Party had only a few hundred members. This is small wonder if you consider that membership entailed heavy prison sentences; two of the main leaders of the party spent 16 years in jail each. But the Communist milieu—and the independent hard left harboured by the social democrats and by the more radical trade unions such as the metal workers and the typesetters—of sympathisers, from unskilled labourers to avant-garde artists, was enormous. These groups were immediately joined by millions of peasants mobilised by land reform. The voters of the agrarian parties were not anti-Communist, anything but. 1945 meant the end of the old ruling classes and political elites, the end of the landed aristocracy, of the immensely rich and rather unpopular Catholic Church with its feudal customs and giant estates, of the old officer corps and of the state bureacracy staffed by the gentry, an end to the feared gendarmerie which had terrorised the countryside without regard for legality or humanity, and an end to racial laws and to ethnic and gender discrimination. Spontaneous communist experiments started by Council Republic veterans (not to speak of the former prisoners of war who took the Bolshevik side in the Russian civil war in 1918-20) were suppressed by the party and the Soviet military authorities. But it was plain that socialist and Communist workers and peasants wanted socialism, not some half-baked people’s democracy. They wanted an immediate Commune order (this was the popular name of the Council Republic, spelt “Kommün”), total socialisation of all means of production, consumer equality, free state education for all, abortion and divorce on demand, a citizens’ army and police and a council system in workplaces and localities. We know what the Stalinists did with all this. They were always fighting the left—and people tend to forget that in the 1940s social democracy was to the left of the Communist Party; this is why it was so mercilessly persecuted. These socialist thoughts and practices were not questioned basically by the unrest that went with the unravelling of the Stalinist regime after the dictator’s death in 1953. The brief course of reforms then, led by prime minister Imre Nagy (a veteran Communist who returned in 1945 from exile in Moscow), aimed at the re-establishment or establishment of “true socialism” including plenty of food, proper heating, full shops, less work and no innocents in jail. And especially, an end to the propagandistic mendacity that got on the nerves of the working people—“truth” was one of the most important demands. Following the Twentieth Congress of the Communist Party of the Soviet Union in February 1956 Nikita Krushchev’s so-called secret speech about Stalin’s crimes was read to millions of party members in closed meetings across Russia and beyond, and disseminated by the BBC Hungarian programme, The Voice of America and Radio Free Europe and by the Yugoslav state radio’s Hungarian-language broadcasts. After this and the resignation of Stalinist leader Mátyás Rákosi and reappointment of the reformer Imre Nagy as prime minister (he was fired in 1955), the most important event was the rehabilitation and the solemn reburial of László Rajk, a former secretary of the Central Committee. Rajk was the executed defendant in the main show trial in 1949. He was reburied on 6 October 1956 in a dramatic, torch-lit mass meeting of hundreds of thousands of people in Budapest. 6 October is a significant day in Hungary: 13 generals of the Hungarian rebel army were executed by the Habsburg counter-revolution on the same day in 1849 (and, separately, Count Batthyány, one of the prime ministers of the revolution in 1848, was also shot in Pest). In this way, the re-establishment of truth, the identification of true socialism with justice, a total rejection of Stalinism and a solemn oath next to Rajk’s catafalque, “Never again”, went hand in hand to constitute the ideology of the 1956 Hungarian Revolution. Again we must keep in mind that the anti-Stalinist rebellion was started and sustained by the generation of 1945, by those who wanted social equality, that is the end of the semi-feudalancien régime, and who wished for the political supremacy of the working class, socialisation of the means of production, state ownership of the banks, public transport, housing, egalitarian redistribution, workers’ co-management in the entreprises, a multi-party system for the anti-fascist forces, friendship with the formerly hostile Eastern European nations, anti-imperialist solidarity, internationalism, freedom of expression, wage equality for women, free education and retraining for adults and so on. These demands were denied by the Stalinist one-party state and they were immediately resurrected as the repression was alleviated. In party cells, trade unions, student associations and intellectual circles a feverish wave of debates and discussions took the place of the deathly silence of the dictatorship. One of the most conspicuous features of these months was the repentance and self-criticism of Communist intellectuals who rejected the slavish, uncritical, fanatical and quasi-religious fervour of the Stalinist period and their own complicity in the reprisals and the inhuman savagery of Stalinist state capitalism. The “Never again!’’ of 6 October was prepared for by this extraordinary re-examination of the revolutionary conscience, the recapture of the pathos of freedom characteristic of both revolutionary moments, 1945 and 1956. Famous poems, essays, confessions, pamphlets—still remembered today—inflamed the imagination of society. Responsibility assumed by the self-critical Communist intellectuals was extended to the party leaders, and innocent leftists just freed from the Stalinist prisons reappeared as the ghosts of liberation, demanding not revenge but justice. The wavering party leadership hesitated between being seduced to join either the movement or its violent suppression. All the grand ideas of socialist revolution reappeared. There was a permanent mobilisation of rational debate—reminiscent of the Nuit debout conversations in Paris this year, but on a much larger scale—that promised an authentic renewal of socialism. It was perfectly clear that nobody desirous of being heard would advocate capitalist or reactionary restoration; the masses would not hear of it. There was a passionate interest in parallel phenomena in Poland, a great curiosity concerning Yugoslav experimentations with workers’ self-management and Third World ideas of democratic socialism. But most of all this was a moral uprising, a rejection of Stalinism, of ­nomenklatura privileges, of militarism and xenophobic isolation from the rest of the world. What has later been dubbed “nationalism” by outside observers was nothing more than the principle of equality between socialist nations—which meant, of course, the repudiation of Russian control—in other words, internationalism. But the essence was the strong disgust for official lies, a powerful desire for honesty, sincerity and responsibility, for revolutionary purity. This moral rejuvenation of socialism has also meant forgiveness for those who were innocent dupes of Stalinist propaganda—and indeed, many intellectuals and activists, guilty of shameful acts of obeisance in the 1950s, had become subsequently heroes and martyrs of the anti-Stalinist revolution. Social discontent and moral revulsion characterised this first episode of 1956. It developed into a fully fledged revolutionary movement only after the attempts to repress it. On 23 October 1956 a huge demonstration took place in Budapest. The special forces fired on the crowd, as a result the government fell, Imre Nagy returned, a multi-party system was declared and the Soviet troops withdrew. The centre of power was in the hands of the proletariat, of the swiftly formed workers’ councils. But the focus was on political liberty, pluralism, freedom of expression and on a new constitutional republic. It was made clear, once again, that the nationalised and socialised enterprises and institutions would remain in the hands of the people, but ruled by the people, not by the apparat. No significant force demanded joining the Western alliances. Privatisations and the introduction of a market economy were deliberately and decisively rejected. At the same time, people demanded the departure of the Russian troops and true national independence. The spectre of counter-revolution appeared, too, in acts of summary justice and a few cases of lynching of party officials and of special forces. This, however, was greeted with indignation and revulsion by the majority. The Communist Party dispersed and, although at the helm of the state, the surviving organisation understood that it had no chance of winning the coming elections. A separate social democratic party was again becoming stronger, and it might have become the leading force in society, given the opportunity. The newly formed Politburo and the Nagy government—with members such as the celebrated Marxist philosopher Georg Lukács—advocated a pluralist socialist democracy, based on the collective ownership of the means of production and on democratic planning, subject to the free decision of the nation in multi-party elections and workplace democracy. There seemed no risk of a move to Western-style free market capitalism. Nevertheless, the rest of the Soviet bloc had decided that the Hungarian Revolution was not to be tolerated. A Russian military attack was launched on 4 November, and the Hungarian revolutionary government quit the Warsaw Pact and declared Hungary’s neutrality. The country was occupied and the revolutionary leadership arrested and deported. Formally, a Quisling government headed by János Kádár (who, until that moment, was a loyal member of the Nagy government and was no different from the rest of the democratic Communist leadership) was supposed to take over, but the real power belonged to the KGB and to the Russian military. The Hungarian people’s resistance was unanimous; the Kádár clique was totally isolated; there was no trace of treason. Hundreds of thousands fled through the Austrian frontier. The foci of armed struggle were very difficult to subdue. The Hungarian army, trained and armed by the Soviet Union—many officers were heroes of the clandestine anti-fascist resistance during the war—all refused to participate in the occupation and the repression. The special forces were disbanded, and the police were passive or hostile to the Russians. The semi-legal press kept to the popular line of neutrality, independence and socialist democracy. It was the Soviet Union that was accused of betraying socialism, as indeed it had. The quiet heroism and the patience of the population were extraordinary. And the most wonderful chapter of the revolution was only to come with the beginning of the general strike. Workers’ councils were formed in all factories, entreprises and state institutions before 4 November. Then they shared their influence with the “reform Communist” government, with the newly formed or reborn democratic parties and with the trade unions. As these latter were all banned by the Russian military authorities and the local puppet government, the councils found themselves to be the only remaining legitimate political institution in Hungary. Their weapon—and a formidable one—was the general strike which was observed in spite of the curfew and of the state of siege, as millions of Hungarian workers and other employees simply did not turn up at work. In all revolutionary moments, from the Paris Commune to the October Revolution, Munich and Budapest in 1919, Barcelona, Canton and Shanghai, the proletarian state form has always been and remains the form of non-representative, direct democracy at the workplace. Solidarność, the Polish resistance that is supposed to have put an end to Soviet-style state “socialism”, was no trade union as it was not organised according to crafts and professions, but as a territorial network of workers’ councils and factory cells, akin to the original communist party idea. Even if Solidarność was ideologically and rhetorically conservative, its formal principle—direct workplace democracy—was fundamentally proletarian and communist. I recall talking to Sándor Rácz, the chairman of the Greater Budapest Workers’ Council, one of the leaders of the resistance, in 1992. He was by then a deeply reactionary public figure and a brave and honest Hungarian patriot. I asked him whether he thought his present role was consonant with his past. He said, laughing, “No, in 1956 I was a Communist; I became a Catholic and a nationalist only in prison”. He was 23 years old during the revolution, a convinced far-left figure and a cunning, clever negotiator who managed to stay the outbreak of state violence for months. For a long time the Hungarian proletariat has kept the idea of social ownership and of free socialism alive, against the strongest military power on earth—and against the indifference and connivance of the “liberal” West. G.M. Tamás: “We Must Return to Politi ..
And this is what they call an anti-communist revolution, a vindication of an authoritarian past, a nationalist uprising and even, according to the far-right historian David Irving, an anti-Jewish rebellion, while many of the hanged revolutionaries were Jewish communists. After the defeat of the general strike the Kádár regime executed only the leftists—the conservatives who joined the people’s cause were already being given literary prizes and medals in 1957, when the firing squads were still busy pacifying Hungary. They knew exactly who the real enemies were. They were people like you, dear reader. 1 The Hungarian Council Republic was set up in March 1919 and overthrown by a Romanian invading army in August. G M Tamás is a Hungarian philosopher and public intellectual. A dissident before 1989, he was a Member of Parliament (1990-94) and the Director of the Institute of Philosophy of the Hungarian Academy. His latest book is Kommunismus nach 1989 (Vienna, 2015).